Rev. Ike's Secrets for Health, Joy and Prosperity, For YOU! Learn How to Harness the power of YOUR OWN MIND to achieve good health, happiness, success, and prosperity! In 52 easy-to-read life-changing chapters, Rev. 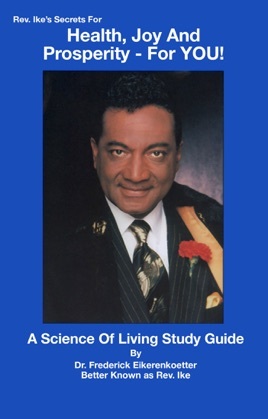 Ike introduces you to his Science Of Living philosophy and turns you on to a whole new way of thinking! You have the God-given power to change your thoughts and change your life! And this book shows you HOW TO DO IT! You'll find 'Practical How-to' advice on living, visualization exercises and consciousness-raising affirmations that you can put to work right away to change your conditions! You learn the 'shocking' truth about who God is in you, and discover the 'real' Jesus. After reading this book the Bible will never be the same -- you will understand it, in a beautiful new way! Are you ready to 'wash out' doubt, fear and worry -- and IMPLANT self-esteem, success and love into your subconscious? Then fasten your seat belt, open your mind, hold on to your hat -- get this book now -- and 'get right with yourself'! And when you are right with yourself, everything in life will be right for you.